In the darkest hours of the night, the cosmos illuminates our path with the icy blue-white glow of starlight. Wings summons the spirits of the stars themselves in this sixth entry in the revival of his signature series of earrings that honor the light, Stars appearing in their most ancient traditional form, animated by the cold blue fire of adularescence. Each drop is a perfectly circle domed from beneath, repoussé-fashion, t0 create a softly rounded concha. Across the front, an eight-pointed star extends to cardinal and ordinal points by way of hand-stamped spokes fanning outward around the center. Each spoke ends in a hoop whose task it is to link the lodge pattern, radiant with the literal and metaphorical light, that lies between each tiny circle. At the center of the starburst, in a sawtoothed bezel, sits a single round cabochon of luminous rainbow moonstone, the cold clear fire of night refracting the blue of ancient galaxies. 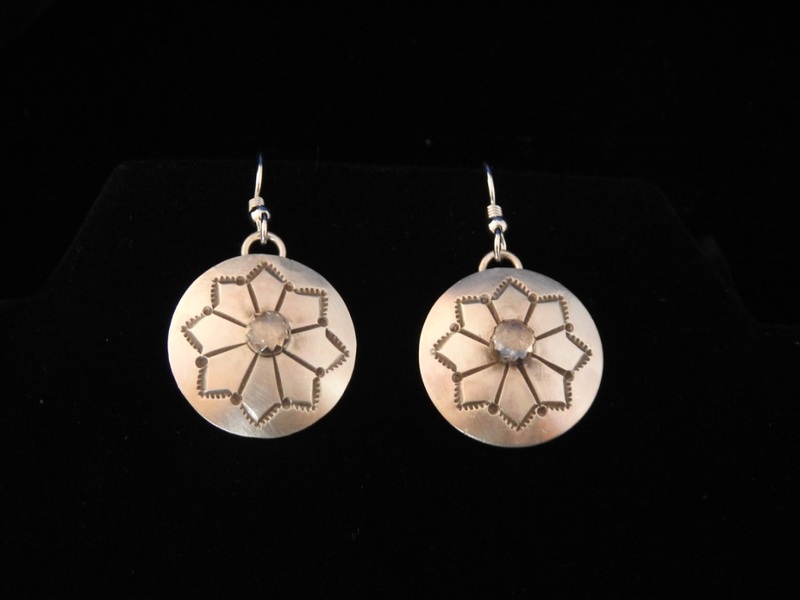 Conchas are polished to a soft Florentine finish; tiny silver jump rings attach the earrings securely to sterling silver wires. Earrings are 7/8″ across (excluding jump rings and wires); cabochons are 3/16″ across (dimensions approximate). Posted on Wednesday, December 26th, 2018 at 3:25 pm. Filed under: Earrings	RSS 2.0 feed.